Dustin oversees the daily operations and project management for the five crews located in Rochester, along with overseeing our prescribed burn activities in the south district. He started with the Corps as a crew member in 2003, became a crew leader in 2004-2005 and has been a staff member since 2006! 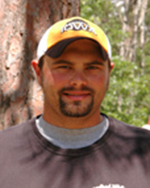 Dustin brings expertise in prescribed fire and chainsaw training. He is most known for his RXB2 burn boss certification. Dustin’s favorite thing about Conservation Corps is seeing how new folks grow both mentally and physically in the program over the course of one year. Outside of work Dustin enjoys spending time with his wife, Erika and two kids, Scarlett and August. He also enjoys hunting and fishing as much as possible.